Shaunty Kleinschmidt was born and raised on the island of O’ahu. She graduated from Kamehameha High School in May 2006. Currently, she is a freshman at the University of Hawai‘i at M?noa College of Engineering in pursuit of a degree in electrical engineering. 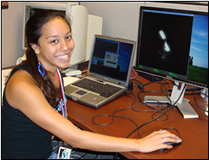 She is involved with the Native Hawaiian Science and Engineering Mentorship Program. She enjoys swimming, going to the beach, and doing sudoku. jTrack is an innovative computer program that analyzes a sequence of images of satellites and allows the user to determine the body-pointing ground track – the location on the Earth at which the satellite is looking. After becoming familiar with jTrack, the goals of this project are to determine satellite poses using accurate models overlaid onto the post-processed imagery, to estimate ground tracks, and to determine the correlation between image resolution and ground track errors. Given at least 20 sequential images of a satellite, a model of the satellite is manipulated by a user so that it appears as if the model and the image of the satellite coincide. Once the user is finished angling the model, jTrack determines the body-pointing ground track and generates a data table for the latitude and longitude of the model for each frame. By working with simulated images of satellites, the true location on the Earth at which the satellites point is known. Matlab is used to compare the trials with the truth, calculating the ground track errors. The results are then transferred to Google Earth for visualization. The ground track analysis and the correlation between image resolution and ground track errors will be discussed.